Last year I watched from a distance as the GLI.TC/H 2010 festival unfurled itself in Chicago. A gathering of glitch obsessed artists, tech-geeks and critical interveners (imagine a venn diagram where all three of those bleed into each other). I watched with growing pleasure as their blog became filled with some of the prime-est glitch resources I had witnessed. Papers on the aesthetics of the glitch; technical elaborations on the possibilities of certain software/hardware systems; artistic explosions in the form of video, audio and image. Gli.tc/h was organised by people fascinated with the critical possibilities of the glitch, of the broken-file-format and kludged together hardware solution. The GLTI.CH Karaoke name and URL was born, partly, in homage to their fine work. This year we jumped at the opportunity to submit to GLI.TC/H 20111, now split into three segments like some dismembered robot: Chicago, Amsterdam AND Birmingham now set to glitch throughout the cosmos. Although our methods may not be subtle, we are modest, and so we (that is, Daniel and Kyougn) aimed our proposal at Birmingham, with a wink and a nod to Amsterdam, never really believing they’d beckon us over the North Sea. Kaboom! Chicago contacted us first, and then Amsterdam and then Birmingham: GLTI.CH Karaoke is in demand! 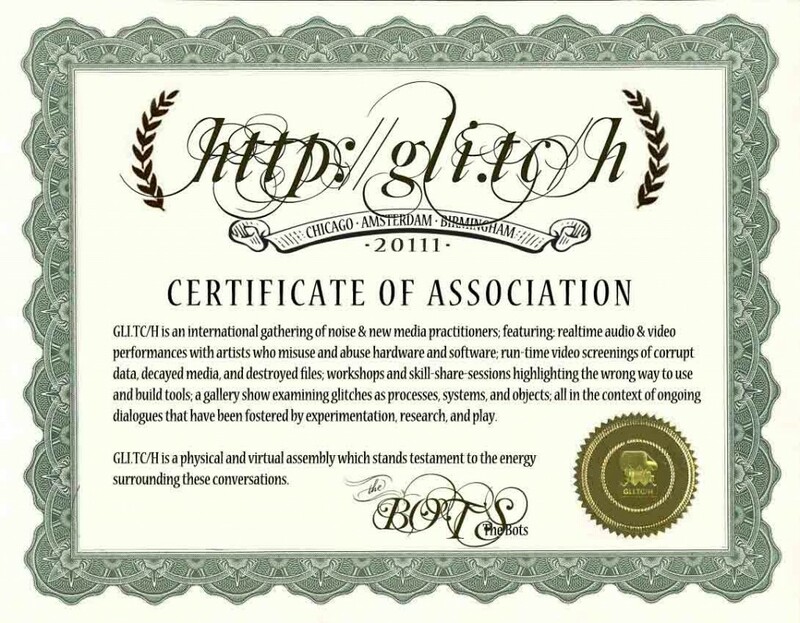 As you can see from our stunning certificate, the people at GLI.TC/H 20111 don’t mess around. We’ll be attending in person to both the Amsterdam and Birmingham events, and trans-web-streamed to Chicago (see below and follow the GLI.TC/H Schedule for more info). So come, join us, sing along, listen to our critical minds meander. GLTI.CH Karaoke is sailing to new continents! @7pm  -- GLI.TC/H Screening Program [sec1] <-- Glti.ch Karaoke here! @3pm  -- Lectures @VIVID <-- Glti.ch Karaoke here!